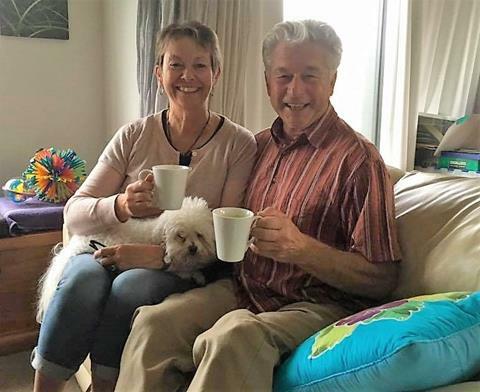 LINK is celebrating the power of neighbourhood connection along with Neighbours Day Aotearoa. It's the tenth year this has been recognised nationally in New Zealand, this time over ten days, March 22-31. Communities are encouraged to host street or neighbourhood BBQs, desserts, games, etc. You can check out LINK's "How to organise a neighbourhood gathering guide" here. 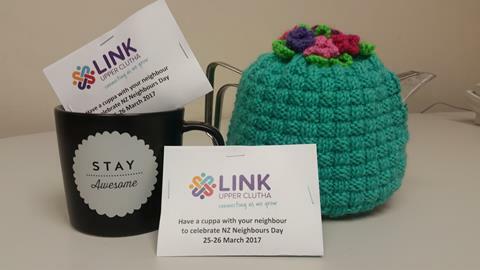 Here in the Upper Clutha, LINK will distribute free 2-teabag "Have a Cuppa" packs to residents to encourage them to meet or re-meet neighbours on their street. There are so many reasons to connect with your neighbours -- social, safety, local spirit. Look out for our top tips in your letterbox soon, and enjoy that cuppa! Town Centre Masterplan - the next step is happening this weekend! Most people will have heard by now about the big experiment by the lakefront happening this week... Council is testing new ways of moving around and enjoying town. This is all part of the Town Centre Masterplan design process -- considering how people want Wanaka to look, feel, and function in the next 30 years. The trials are based on community input given in September 2018, bringing to life a pedestrianised section that connects the lake with town which will be filled with a variety of games and activities. Transport patterns are being tested, with one-way traffic and diverted parking. Check out the QLDC website for all the details. A main objective of the trials is to collect data on both the experience and on the draft design options that will be on display. IF YOU WANT TO GET INVOLVED, you can be the first to find out what people think by administering a survey in the main hub tent. Email wanakamasterplan@qldc.govt.nz to volunteer for a slot or with any questions. A glimpse into the future... TOMORROW MARCH 13! Wanaka is doing lots of thinking about our future. How, where, why we work; what jobs will be available; and what skills we need are important to understand. 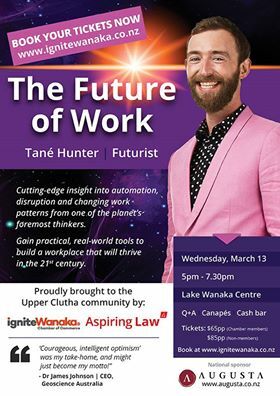 Tane is an amazing speaker with lots of insights. His company Future Crunch reviews global information and trends so you don't have to, and helps make it all relevant and understandable. Wanaka’s first Relay For Life event is happening on the 23/24 March 2019 at Pembroke Park. It is a fun, community-driven, 24 hour event that allows people of all ages and from different backgrounds to join together, camp out down at Pembroke Park and walk (or run) relay-style throughout a programme of entertainment and activities. All funds raised will be used to help the Cancer Society Otago Southland provide their services.